Reading Mystery Teachings from the Living Earth was a curious experience. I felt like I was reading two books at once: the first describing spiritual teachings we can derive from ecological laws; the second, how the mystery teachings are being misinterpreted and distorted by more modern spiritual movements. …the self and the rest of the universe join together at each moment to create the reality you will experience in the future. Thus, there are things you can accomplish and things that no amount of tinkering with attitudes will allow you to achieve, because they are contradicted by the momentum of greater processes in the universe as a whole. Equally, there are things you might be able to achieve but should not attempt, because the achievement will set patterns in motion in the universe that will not be welcome to you. This is the nut around which the whole book turns. He makes the argument that those “tinkering with attitudes” and doings things that should not be attempted because their result might be unwelcome (i.e., treating the Earth as a disposable commodity) are departing from the traditional mystery school teachings, and contributing to the calamities facing our planet. Greer does not identify himself as a practitioner in any mystery school until the afterword and author bio at the end of the book. 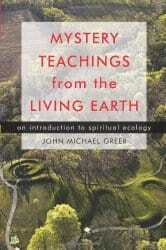 If you don’t happen to know that John Michael Greer is an ecologist and leader of the modern Druid movement (the Grand Archdruid of the Ancient Order of Druids in America, no less), you might wonder how he came by his knowledge or who he is or why what he says matters. Yet, what is said and who is saying it does matter, and I wish he would have told us a little about his background at the outset to lend some gravitas to his statements. These things matter because he speaks the inconvenient, unpalatable truth that observers of nature can easily discern: that humanity is breaking natural laws right and left, causing the whole system — of which we are a part — to inevitably break down, possibly beyond repair. He presents the seven laws of spiritual ecology in a well thought-out manner, using the metaphor of a meadow, its inhabitants and the life processes therein to demonstrate them. Greer offers simple meditations at the end of each chapter inviting the reader to explore the laws in the context of their own life. Greer spends much time finding fault with high-priced organizations that bill themselves as mystery schools, promising students a fast track to becoming an ascended master, or promulgating the belief that the world is either at the dawn of a promised golden age or on the verge of apocalypse. I agree with him, and I’m glad someone said it, because too many sincere people fall for these claims. However, I would have liked more discussion of how the student can live within the laws of spiritual ecology in a practical manner. How do these laws show up in our everyday world, and what actions can we take (or not) on an individual and community level to begin the transformation? Greer treats these chapters in a somewhat scholarly and abstract manner and gives a few examples, yet I found myself wanting more. Mystery Teachings from the Living Earth is a good starting point for further exploration through authentic teachings, and also sounds a cautionary note to the reader to use discernment when choosing a school. One would do well to take both these themes to heart. – The authentic teachings of the mystery schools offer a profoundly different way of making sense of the universe and our place in it. In Mystery Teachings from the Living Earth, ecologist and Druid initiate John Michael Greer offers an introduction to the core teachings of the mysteries through the mirror of the natural world. and power into our everyday lives. Mystery Teachings from the Living Earth reveals one of the great secrets of the mysteries—that the laws of nature are also the laws of spirit. February 3, 2019 in BOOKS: Mightier Than The Sword, GAIA RISING.